The Good: BLOOD and Gore Galore!!!! I have no idea how this passed for just a rated R film...but I'm not complaining and I doubt you will either. Very little to any slow moments. You'll be kept in suspense from beginning to end. The story line is so relevant and modern that it's actually understandable (in the beginning anyway) how the characters get into the horrible situations. In other words, the characters are only mildly dumb and naive compared to being completely oblivious to danger in old school horror movies. 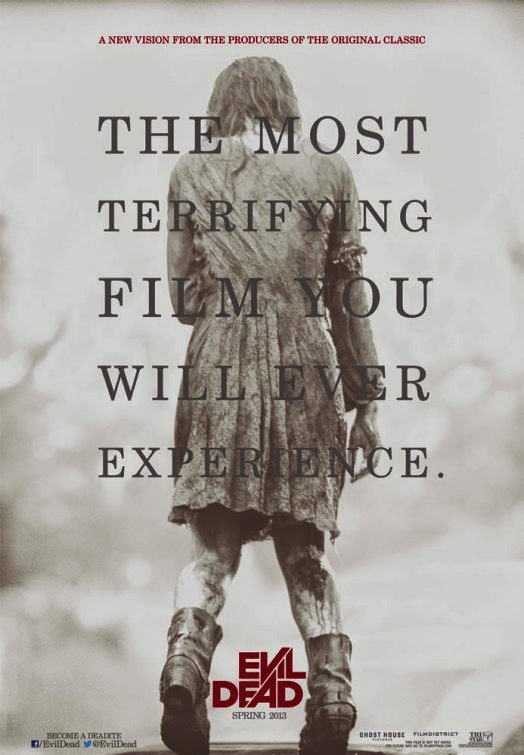 The Bad: Wasn't as scary as advertised. But I'm sure if you're a ”movie theater jumper" you'll still jump in a few scenes. The Reason: This is NOT for those with weak stomachs. If you couldn't handle the Saw movies then this may be too much for you too. Seeing as though I took the time to catch up on the previous 1980's Evil Dead films, this rendition did a masterful job of being a ”remake” for a more modern audience. If you happen to be a fan of the Evil Dead franchise, you'll also appreciate all the notable instances that pay homage to the original films. (Car, shotgun, chainsaw, etc) Definitely worth watching in the theaters and I'd venture to say it may be one of the best horror flicks (that's not really scary) this year.